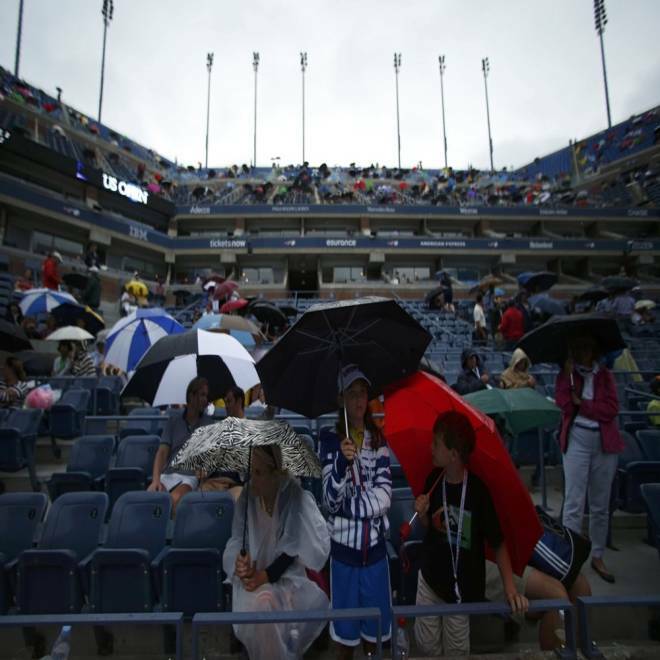 Tennis fans shelter from the rain while play is suspended at the U.S. Open tennis tournament in New York City on Tuesday. The remnants of former Hurricane Isaac brought heavy rain and strong winds -- and the risk of localized flash flooding -- to the East Coast overnight and into Tuesday. New York City can expect up to three inches of rain Tuesday and Wednesday, NBCNewYork.com reported. High humidity will make temperatures feel like the high 80s, it added. Torrential downpours were forecast for the Northeast and South Atlantic states, while thunderstorms were possible across the Midwest. The system follows a humid, damp and windy end to the Labor Day weekend in many parts, including Delaware, where strong thunderstorms and winds of up to 60 mph ripped through Kent County, Del., on Monday, damaging homes, according to NBCPhiladelphia.com. The Weather Channel said the turbulent weather was caused by the merger of the remnant low pressure of Isaac with a frontal boundary across the Midwest. "That low and that front are still with us, and will be poking into the Northeast by Wednesday," wrote the Weather Channel's Nick Wiltgen. "They'll interact with rich tropical moisture to bring the threat of tropical downpours up and down the eastern seaboard Tuesday and Wednesday." "These will be the kind of downpours that can put down an inch of rain in less than an hour and reduce visibility to a few hundred feet," he added, "so drivers and air travelers can expect occasional delays. Localized flash flooding is possible." Around 20 homes in Camden, Del., were damaged during Monday’s storm there. Those who saw it coming ran into their homes and ducked for cover. "When we went in, I shut the sliding doors and something hit the house so hard and we just dropped to the floor," Jean Hanacek told NBCPhiladelphia.com. "My whole garage is gone and my two cars are in there." In the Midwest, rain brought about by Hurricane Isaac has quenched fields parched by months of drought. Whether the rains have helped remains to be seen. NBC's Diana Alvear reports.